Canada's largest crypto exchange filed for bankruptcy on Friday claiming liabilities of about $210 million and assets of about $30 million. The filing and a notice on the website said the company has been unable to recover the private keys of its considerable holdings of cryptocurrencies. They were apparently lost after the death of the 30-year old founder and CEO Gerald Cotton (above) on a trip to India. The bankruptcy claimed 26,500 BTC, 20,000 LTC and 430,000 Ethereum, among others holdings. It would be the fourth-largest known crypto hack. "The laptop computer from which Gerry carried out the companies' business is encrypted and I do not know the password or recovery key. Despite repeated and diligent searches, I have not been able to find them written down anywhere," his wife said in the bankruptcy filing. The company had 115,000 active users. Since the announcement, blockchain-watchers have set out to find the wallets that might contain the reserves. Immediate question have arisen. Kraken CEO Jesse Powell first cast vague doubts about the reserves. 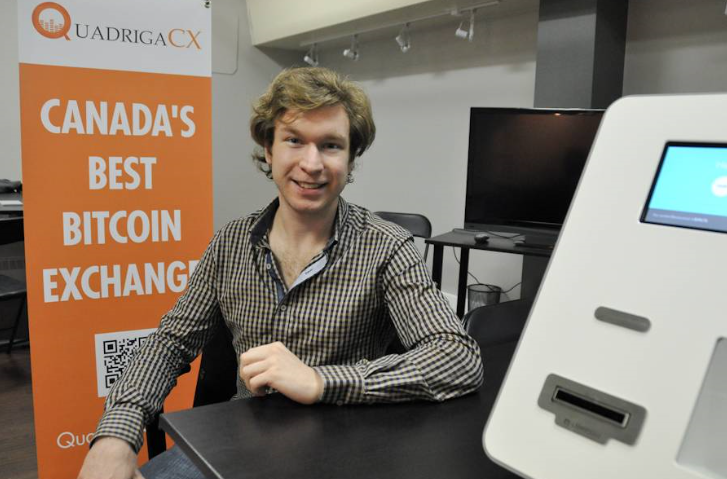 Others have noted that money continues to flow in and out of its Litecoin wallets associated with QuadrigaCX. Now, there is growing speculation that the company never had the Bitcoin reserves at all. There has been plenty of speculation that the founder faked his death but I don't think that happened. I think they were lost, squandered and/or hacked. The company had publicized some losses. It's also possible the founder had unwisely invested in crypto ICOs with customer funds and lost them. Evidence is the lax accounting at the company. According to the filing there are hardly any accounting records. "To the best of my knowledge, most of the business of the Companies was being conducted by Gerry wherever he and his computer were located," the filing said. It also notes that in 2016 all of the other directors resigned and that Cotton was the sole director. The company was also hit with a cease trade order for failing to file financial statements. His wife also said she has been unable to find any corporate records. I find it almost impossible to believe that Canada's largest exchange was essentially run by one person and a handful of contractors. If the accounts were meticulously maintained, it would have been necessary to have checks and balances. Nevermind the stupidity of having only one person with access to the private keys. My guess is that the founder somehow lost out massively and resorted to operating a ponzi scheme to balance withdrawals. 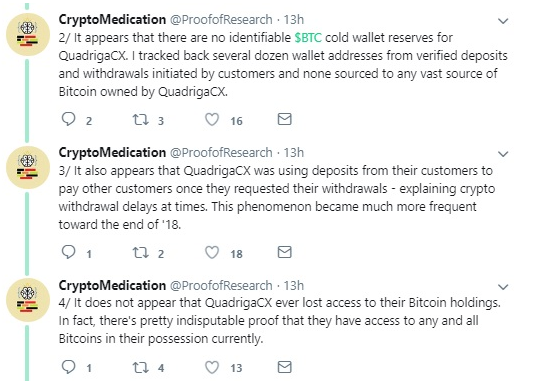 That would explain the frequent delays in processing withdrawals for the past year. Yet it gets even weirder from there. Safe to say there will be plenty more to come.